I don't know about you people but I have a hard time finding knitting patterns I like. I don't want to knit a million scarves, but apart from scarves (and, well, socks) I rarely find patterns for things I'd actually like to wear. A fair isle sweater is on my list of things I'd like to make some day, but I'd like to get just a bit more experience first. Anyway, I found an amazing little shop on Etsy that I just had to share: Tiny Owl's Magic Attic. It has a bunch of really fun and quirky knitting patterns that I totally want to try out! I'm not sure how wearable some of the things really are (for me), but it's all lovely. I picked out three favourites that I wanted to share. First up is the Bo Peep scarf. A huge knitted bow? Yes please! I'm intrigued by the construction of this as the item description says: "the scarf is started diagonally to give nice angled points to the ties, then uses clever decreases & increases to make a bow-tie shape". Just tying a scarf in a bow is one thing, but this sounds really neat. 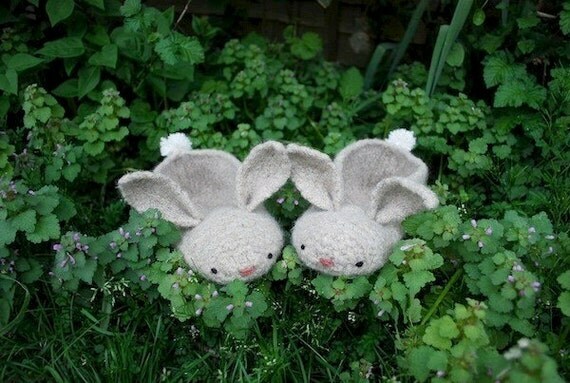 Second: Bunny slippers! I might just have squealed when I saw these cuties. They are knitted flat and sewn together with only three seams "which can be sloppy as you like" according to the description. The slippers are then felted to fit, which is something I'd love to try my hand at. Finally, these lovely wristees seem like the perfect way to keep little hands warm this winter. 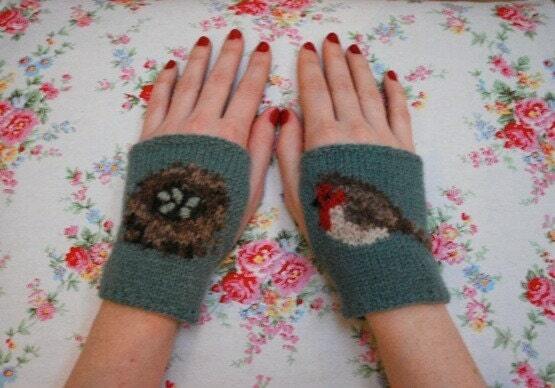 They also seem like a great way to combine my love of birds with my wish to learn to knit with several colours. A small motive like this must be a great starting point, no? That's it for this time, you should hop on over and have a look!